President Vladimir Putin has rejected Western criticism of his foreign policy, describing it as part of a smear campaign serving internal political goals. Putin scoffed at Western claims that he wants to dominate the world, saying it’s the United States that aspires to do that. He pointed at U.S. annual defense spending exceeding $700 billion, comparing it with Russia’s military budget of $46 billion. He said Western talk about Russia’s aggressive intentions uses cliches to cement NATO’s solidarity and exploits historic fears in domestic political interests. Putin said that all Russia wants is an equal role in global affairs to help its domestic development. President Vladimir Putin has described British accusations of Russian involvement in the poisoning of a former spy as part of Western efforts to isolate and weaken Russia, but voiced readiness to normalize ties. Speaking at Thursday’s news conference, Putin also said that Russia could be affected by economic fallout from Britain’s forthcoming exit from the European Union, but noted that British Prime Minister Theresa May’s Cabinet had no other option but to implement the decision taken by the British people. Putin reaffirmed Russia’s readiness to improve ties with Britain frozen after the poisoning of Sergei Skripal and his daughter in March. Orkhan Dzhemal, Alexander Rastorguyev and Kirill Radchenko were shot dead in July while investigating a Russian military contractor known as Wagner, which operates in the Central African Republic. Putin, speaking at Thursday’s news conference, said the reporters were apparently killed by one of militant groups in the African nation, adding that the official probe there is continuing. The Wagner company has been linked to Yevgeny Prigozhin. 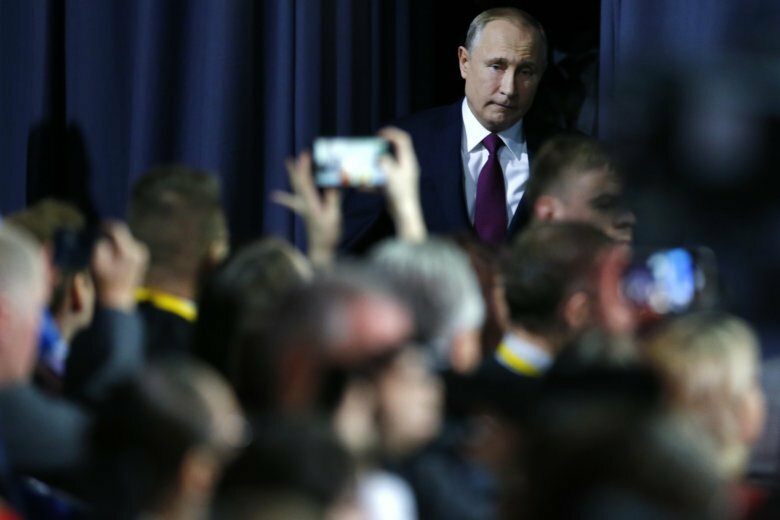 Putin scoffed at media descriptions of Prigozhin as “Putin’s chef,” adding that the federal bodyguard service provides food for him. He added that it would be up to Russian prosecutors to investigate if the company broke any laws. President Vladimir Putin says that a Russian woman in custody in the United States who has pleaded guilty to acting as a covert agent of the Russian government hasn’t carried out any government missions. Earlier this month, Maria Butina pleaded guilty to a conspiracy charge for trying to infiltrate conservative political groups in the U.S., as part of a deal with federal prosecutors. Speaking Thursday at his annual news conference, Putin claimed that Butina made the plea because of the threat of a long prison sentence in the case, which he described as fabricated. The Russian leader pledged that Russia will continue to support Butina. Russian President Vladimir Putin is welcoming the U.S. decision to withdraw its military from Syria. Speaking Thursday at his annual news conference, Putin said he agrees with U.S. President Donald Trump who said Wednesday that the defeat of the Islamic State group removes the need for the U.S. military presence in the country. The Russian leader added that it remains to be seen whether the U.S. delivers on its plan, noting Washington’s repeated promises to end its 17-year presence in Afghanistan. Russian President Vladimir Putin has accused his Ukrainian counterpart of provoking a naval standoff with Russia to boost his electoral prospects. Speaking at his annual marathon news conference Thursday, Putin charged that Ukrainian President Petro Poroshenko organized the naval foray to bolster his sagging popularity before March’s election. The Russian leader noted that while Poroshenko has managed to slightly improve his rating, he has hurt his nation by doing that. Russian President Vladimir Putin is warning about the rising threat of a nuclear war. Speaking at his annual news conference Thursday, Putin pointed at the U.S. intention to withdraw from the 1987 Intermediate-Range Nuclear Forces (INF) Treaty. He said that if the U.S. puts intermediate-range missiles in Europe, Russia will be forced to take countermeasures. President Vladimir Putin is hailing another year of Russian economic growth after a previous period of stagnation. Putin said at an annual news conference summing up the results of the year that Russia’s gross domestic product is set to grow by 1.8 percent this year, while industrial output has grown faster at 3 percent. The Russian president noted Thursday that the nation’s hard currency reserves have increased from $432 billion at the start of the year to $464 billion now. The positive statistics follow a difficult period in recent years when Russia’s economy has suffered a combined blow of low oil prices and Western sanctions, resulting in stagnation.